트럼프 미 대통령이 지난 22일 그의 행정부가 가하려 했던 대북 추가제재를 철회하도록 지시했다고 자신의 트윗을 통해 발표하자 미 행정부는 그야말로 혼란에 빠졌다. 트럼프의 트윗 하루 전인 목요일까지도 존 볼턴 트럼프 국가안보보좌관도 제재 조치가 얼마나 중요한지를 트위터에 올려 미국의 대북 목조이기는 기정사실로 보였기 때문이다. 여러 가지 경로로 드러나는 뉴스들로 볼 때 미 재무부를 중심으로 현 대북제재 조치보다 더욱 강화된 대북 제재 조치가 발표될 것은 분명해 보였다. 그런데 트럼프의 “오늘 미국 재무부가 기존 대북 제재조치에 대규모 제재조치를 추가할 것이라고 발표했다. 나는 오늘 그 추가 제재의 철회를 지시했다!”라는 트윗 한방이 이 모든 것을 뒤집어 버린 것이다. 전례 없는 이런 사실을 두고 언론들은 트럼프 행정부의 엇박자를 혼란스런 시선으로 보도했다. 이런 가운데 세계 최대 인터넷언론인 VOX가 트럼프의 이런 돌발적인 행동이 하노이 회담 이후 강경론으로 돌아서고 있는 북의 김정은 위원장에게 잘 보이기 위한 행동이었다고 분석했다. VOX는 22일 국제 외교안보 전문가인 알렉스 워드의 “Trump scrapped sanctions on North Korea to please Kim Jong Un-트럼프, 김정은 기분 맞추기 위해 대북 제재 철회”라는 제목의 기사를 통해 “ 트럼프 대통령은 김정은 위원장이 핵 폐기를 위해 거의 아무것도 하지 않은 잔인한 독재자임에도 불구하고 김 위원장의 기분을 맞추기 위해 자신의 행정부와 뜻을 달리 했다는 것”이라고 해석했다. 즉 김위원장이 북미 협상을 중단할 수 있다는 우려 때문이라며 실제로 북은 인공위성 발사 움직임과 남북 연락 사무소 철수 등의 우려되는 수순을 밟고 있고 트럼프는 북이 협상대열에서 이탈하는 것을 막기 위한 것이라는 것이다. 알렉스 워드는 진짜 문제는 트럼프의 갑작스러운 제재 번복이 아니라 그 트윗이 트럼프의 대북정책에 대해 시사하는 점이라며 ‘트럼프와 정부는 다른 생각을 가지고 있다.’고 진단했다. 알렉스 워드는 트럼프의 트윗 배경에 대해 “트럼프 정부는 제재안을 만들고 이행을 추진했다. 그러나 트럼프는 분명 무슨 일이 진행되고 있는지 잘 모르고 있었다. 새로운 대북제재 조치 내용을 들었을 때, 트럼프는 그 진행을 멈추라고 명령한 것으로 보인다.”고 분석했다. 또 다른 후한 해석은 좋은 사람으로 보이려는 노력의 일환으로, 트럼프가 모든 일을 사전에 기획하여, 미국이 대북제재를 가하려고 하는 바로 그때 트럼프 단독으로 이를 저지하는 식으로 자신이 여전히 잘 해보려는 의사를 가지고 있음을 김 위원장에게 알리려 한다는 것이라고 Alex Ward는 전했다. 다음은 뉴스프로가 복스의 기사를 전문 번역한 것이다. Trump’s shocking North Korea tweet, decoded. 트럼프 대통령이 2019년 3월 22일 백악관을 출발하기 전 기자들과 대담을 나누고 있다. President Donald Trump just reversed a plan to impose sanctions on North Korea intended to strangle its economy — something that his own administration recently said was vitally important. 트럼프 대통령이 북한 경제의 목을 조르기 위한 대북제재 부과 계획을 방금 번복했으며, 이 대북 제재는 최근 자신의 행정부가 매우 중요하다고 발표한 사항이었다. The Trump administration’s chosen strategy for dealing with North Korea’s nuclear program has long been to place sanctions on the country, until it has no choice but to dismantle its arsenal. Should Pyongyang do that, Washington would lift the sanctions in return. 북한 핵 프로그램을 대응하기 위해 트럼프 정부가 오래동안 선택해온 전략은 북한이 핵무기를 해체할 수 밖에 없을 때까지 북한을 제재하는 것이었다. 북한이 그렇게 한다면, 미국은 그 대가로 제재를 해제한다는 것이었다. Last month, Trump met with North Korean leader Kim Jong Un for a summit to haggle over the nuclear program’s future, and many expected them to make a deal. But they came nowhere close to striking such an accord. 트럼프는 지난달 북한 핵 프로그램의 미래에 대해 흥정하기 위해 김정은 국무위원장을 만났으며, 많은 이들은 협상이 성사될 것이라고 기대했다. 그러나 두 정상은 그런 합의의 근처에도 가지 못했다. In response, the US planned to place new and larger sanctions on North Korea next week. But Trump didn’t make that known at the time with his Friday tweet, making it seem like he was talking about something else. 이에 대한 대응으로, 미국은 다음 주에 새롭고 더 큰 대북제재를 부과할 계획이었다. 그런데 금요일 자신의 트윗을 통해 트럼프는 그 계획을 밝히지 않고 마치 자신은 다른 얘기를 하고 있는 듯 보이게 했다. 오늘 미국 재무부는 기존의 대북 제재조치에 대규모 제재조치가 추가될 것이라고 발표했다. 오늘 나는 그 추가 제재의 철회를 명령했다! Indeed, many thought he was referring to sanctions, announced on Thursday, on two Chinese shipping companies for continuing to trade with North Korea. 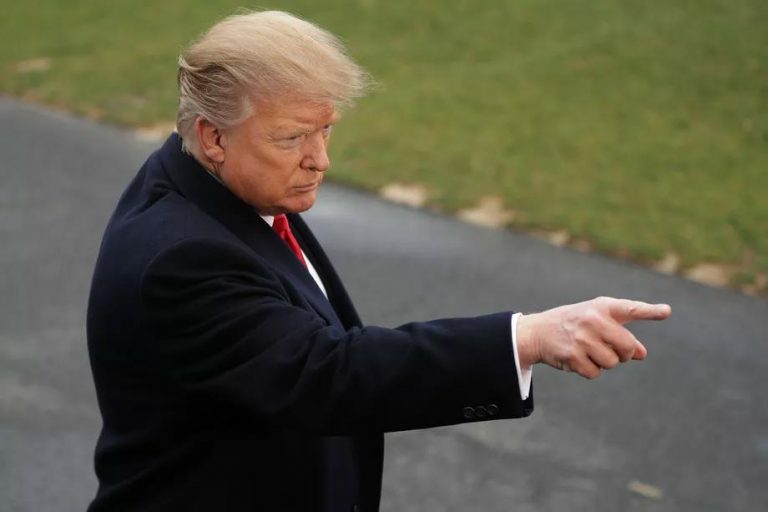 Members of the National Security Council, the White House team that helps the government coordinate foreign policy, even met with reporters to discuss the necessity of the financial penalties. 실제로 많은 사람들은 트럼프가 북한과 계속해서 교역을 하고 있는 두 중국 해운회사에 대해 목요일 발표한 제재안을 언급하고 있다고 생각했다. 트럼프 행정부가 외교정책을 조율하는 데 도움을 주고 있는 백악관 국가안보회의 위원들은 심지어 기자들과 만나 금융제재 필요성을 논의하기도 했다. John Bolton, Trump’s national security adviser, also tweeted on Thursday about how important the sanctions move was. 목요일 존 볼턴 트럼프 국가안보보좌관도 제재 조치가 얼마나 중요한지를 트위터에 올렸다. That’s why experts who track Trump’s North Korea policy were immediately confused by Trump’s tweet. “What the actual f*ck is going on,” tweeted Grace Liu, a North Korea expert with the Middle Institute for International Studies. Others felt the same sentiment. 이것이 바로 트럼프의 대북정책을 분석하는 전문가들이 트럼프의 트윗에 혼란스러워한 이유이다. 미들 국제문제연구소 북한 전문가 그레이스 류는 트위터를 통해 “도대체 무슨 일인지 알 수가 없다”고 밝혔다. 다른 전문가들도 같은 느낌이었다. White House press secretary Sarah Sanders tried to explain, saying: “President Trump likes Chairman Kim and he doesn’t think these sanctions will be necessary,” according to a White House pool report. 사라 샌더스 백악관 대변인은 “트럼프 대통령은 김 위원장에게 호의를 지니고 있으며 이러한 제재가 꼭 필요할 것으로 생각하지 않는다”라고 해명하려고 애썼다. So here’s what this seemingly means: Trump just defied his own administration in order to make Kim happy, even though the North Korea leader is a brutal dictator who has done next to nothing to dismantle his nuclear program. 이게 아마 무슨 의미인가 하면, 트럼프 대통령은 김정은 위원장이 핵 폐기를 위해 거의 아무것도 하지 않은 잔인한 독재자임에도 불구하고 김 위원장의 기분을 맞추기 위해 자신의 행정부와 뜻을 달리 했다는 것이다. There’s a potential reason why: According to one person familiar with the situation, Trump is worried that Kim may back out of diplomatic efforts after the no-deal summit in Vietnam. The worry is somewhat justified, as it seemed North Korea planned to launch a satellite earlier this month and on Friday withdrew officials from a liaison office with South Korea. 그럴만한 이유가 있어 보인다. 이 상황에 정통한 한 사람에 따르면, 트럼프는 김 위원장이 베트남에서의 ‘노 딜 정상회담’ 이후 외교적 노력을 중단할 수 있다고 우려한다. 북한이 이달 초 인공위성을 발사할 계획인 듯하고, 금요일에는 한국과의 연락사무소에서 담당자들을 철수시킨 것을 고려하면 그러한 우려는 어느 정도 타당하다. The real problem, though, isn’t Trump’s sudden sanctions reversal — but rather what it says about his North Korea policy. 하지만 진짜 문제는 트럼프의 갑작스러운 제재 번복이 아니라 그 트윗이 트럼프의 대북정책에 대해 시사하는 점이다. 트럼프와 정부는 다른 생각을 가지고 있다. 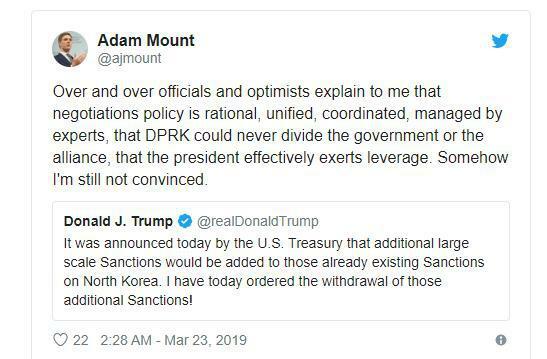 Adam Mount, a North Korea expert at the Federation of American Scientists, tweeted his main reaction to Trump’s announcement. 미국 과학자 연합의 북한 전문가인 애덤 마운트는 트위터를 통해 트럼프 대통령의 발표에 대한 자신의 생각을 올렸다. Over and over officials and optimists explain to me that negotiations policy is rational, unified, coordinated, managed by experts, that DPRK could never divide the government or the alliance, that the president effectively exerts leverage. Somehow I’m still not convinced. 당국자들과 낙관론자들은 나에게 협상 정책이 합리적이고, 통일되어 있으며, 잘 조율되고, 전문가들에 의해 관리되고 있다고, 또 북한은 절대로 정부와 동맹국들의 의견을 갈리게 할 수 없다고, 그리고 대통령이 효과적으로 영향력을 행사한다고 거듭해서 설명해준다. 그런데 나는 그게 잘 믿기지 않는다. That, in a nutshell, is the main takeaway. 간단히 말해, 저 트윗 내용이 바로 주요한 메시지를 준다. Trump’s government went ahead with devising the sanctions and working to implement them. But Trump clearly wasn’t too aware of what was going on. When he heard about it, it seems, he ordered the process to stop. 트럼프 정부는 제재안을 만들고 이행을 추진했다. 그러나 트럼프는 분명 무슨 일이 진행되고 있는지 잘 모르고 있었다. 새로운 대북제재 조치 내용을 들었을 때, 트럼프는 그 진행을 멈추라고 명령한 것으로 보인다. It’s another example of how American foreign policy is increasingly driven by Trump’s whims, and that especially applies to US-North Korea nuclear negotiations. 이는 미국의 외교정책이 점점 더 트럼프의 변덕으로 좌지우지되고 있으며, 특히 북미 핵 협상에서도 마찬가지임을 보여주는 또 한 가지 사례이다. There is a generous interpretation of what just happened, though. Trump, in an effort to look like the good guy, could have orchestrated an entire scheme whereby the US seemed like it was about to place sanctions on North Korea but he single-handedly stopped them — all to let Kim know he’s still willing to play nice. 방금 일어난 일에 대한 후한 해석도 물론 있다. 좋은 사람으로 보이려는 노력의 일환으로, 트럼프가 모든 일을 사전에 기획하여, 미국이 대북제재를 가하려고 하는 바로 그때 트럼프 단독으로 이를 저지하는 식으로 자신이 여전히 잘 해보려는 의사를 가지고 있음을 김 위원장에게 알리려 한다는 것이다. But based on months and months of America’s negotiations with North Korea, which have been nothing short of chaotic, that seems unlikely. In fact, what Trump’s tweet on Friday really shows is that when it comes to his North Korea policy, chaos still reigns. 그러나 그저 혼돈 그 자체였던 지난 수개월간의 대북 협상을 근거로 볼 때, 그 가능성은 희박해 보인다. 실제로 트럼프의 금요일 트윗은 트럼프의 대북정책이 여전히 혼돈 상태임을 여실히 보여주고 있다.